Exhibition catalogue, Tamayo: Recent Paintings, Marlborough Gallery, New York, 1981, no. 10 (illustrated in color). Exhibition catalogue, Rufino Tamayo, The Modern Museum of Art, Santa Ana, California, 1987, p. 12, no. 4 (illustrated in color). 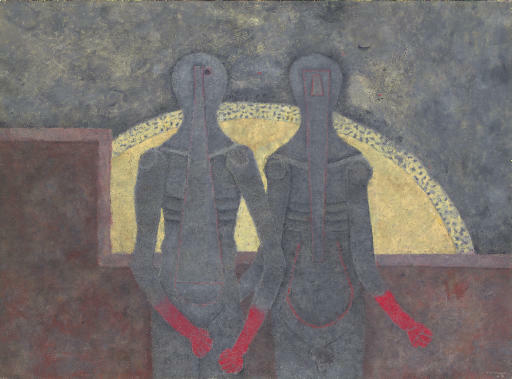 Addendum For Book 'Rufino Tamayo', B. Lewin Galleries, Palm Springs, n/d, p. LI (illustrated in color). T. del Conde, ed., Tamayo, Grupo Financiero Bital, Américo Arte Editores, S.A. de C.V., Mexico City, 1998, p. 121 (illustrated in color). Santa Ana, California, The Modern Museum of Art, Rufino Tamayo, September 1987, no. 4.